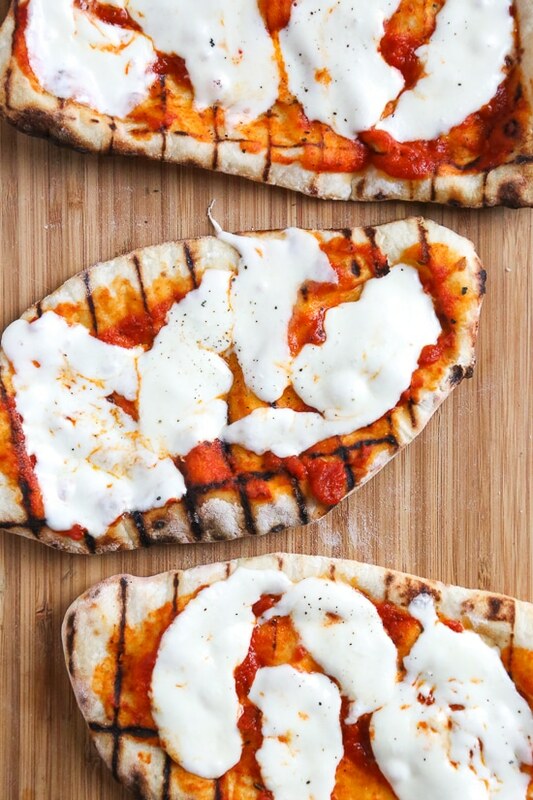 This easy Grilled Pizza is made from scratch with my easy yeast-free Greek yogurt dough, topped with sauce, mozzarella cheese and your choice of toppings. A great summer outdoor meal that whole family can enjoy! I’m sure by now, you’re no stranger to the ever-so-popular Greek yogurt dough used in these bagels, and this Breakfast Pizza. Well I tested it out on the grill and it came out perfect! And the best part of making pizza for dinner is that everyone can customize it with the toppings of their choice. 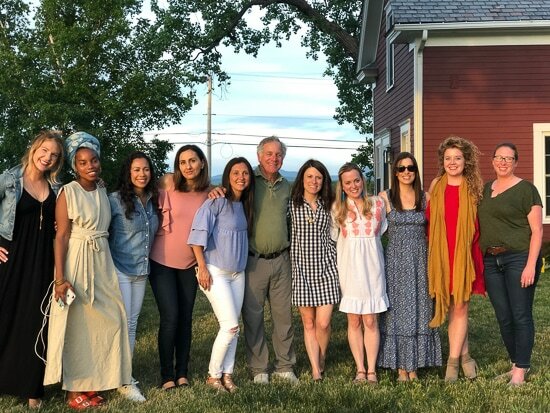 I just got back from an incredible farm tour in Vermont with the team and co-founder of Stonyfield Yogurt, and returned completely inspired and excited to share what I learned about organic farming. Gary Hirshberg, the co-founder of Stonyfield pictured above and next to me is a pioneer in environmental sustainability and organic agriculture. He has dedicated his life to spreading the word about the importance of farming organic which is why all their yogurt is made without the use of toxic persistent pesticides, artificial hormones, antibiotics or GMOs. He has such a passion for bringing awareness to the world, that it was the main focus of the whole trip, and less about his yogurt (which of course is creamy and delicious, by the way!). I was so inspired by him and his passion, and learned so much from him. 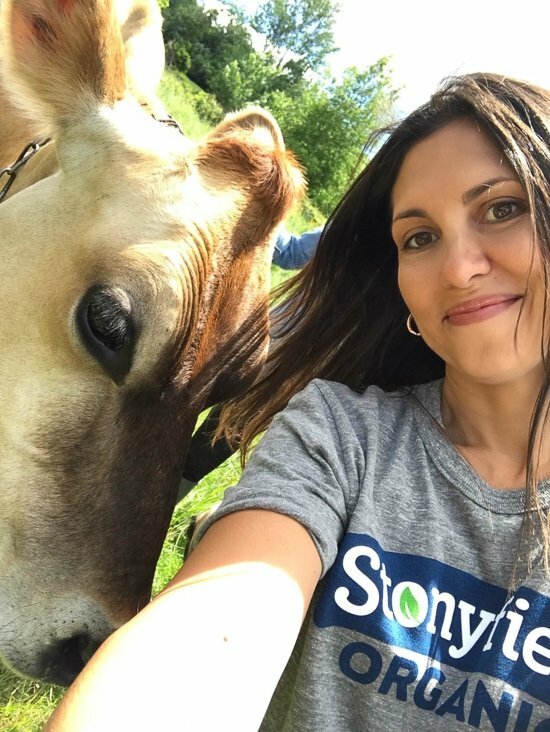 I first made the switch to organic dairy when Madison was born because I knew I didn’t want hormones or antibiotics in her milk. But visiting the farms and meeting the farmers, I returned a little more aware of the importance for consuming and purchasing organic dairy, not just for her but for my whole family. It’s better for you. Because it comes from cows that are actively grazing on grass, as nature intended. Organically raised cows spend their days outside on pasture so the milk they produce is significantly higher in Omega-3 fatty acids and CLA (conjugated linoleic acid), heart-healthy fats that can help lower bad cholesterol and increase good cholesterol. There’s also compelling evidence that many organic fruits and veggies are more nutritious, too. It’s better for our children’s health. Research has demonstrated that an organic diet can dramatically reduce pesticide levels in kids’ bodies. It’s good for the planet. One of the main goals of organic farming practices is to avoid soil contamination as well as rivers, drinking water, and air with toxic persistent chemicals. It’s also better for the farmer and their neighbors, as they aren’t exposed to potentially carcinogenic herbicides. It’s better for the bees. When you see the USDA Organic seal, you’re purchasing food free of artificial flavors or preservatives, toxic persistent pesticides, artificial hormones, antibiotics, and genetically modified organisms (GMOs). 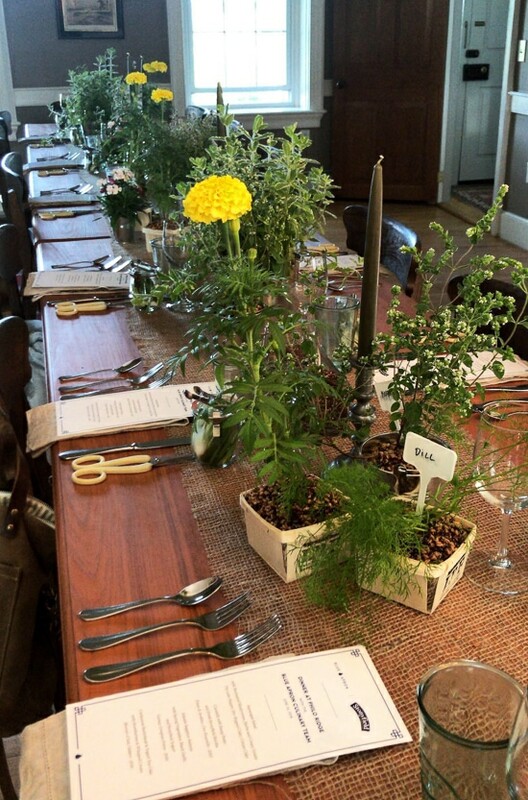 On our last night of the tour, we had an incredible, interactive meal at Philo Ridge farm. Dinner was cooked for us by the chefs at Blue Apron using locally sourced vegetables. If you’re not familiar with them, Blue Apron delivers all the fresh ingredients you need, right to your doorstep, in exactly the right proportions. All their ingredients are incredibly fresh and sourced from quality suppliers and artisans. 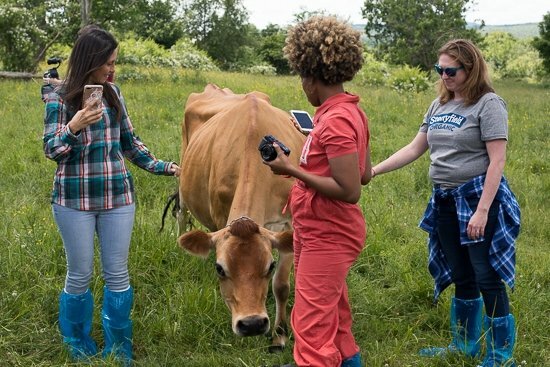 They are partnering with Stonyfield and sustainability experts to create better standards for growing food and raising animals. 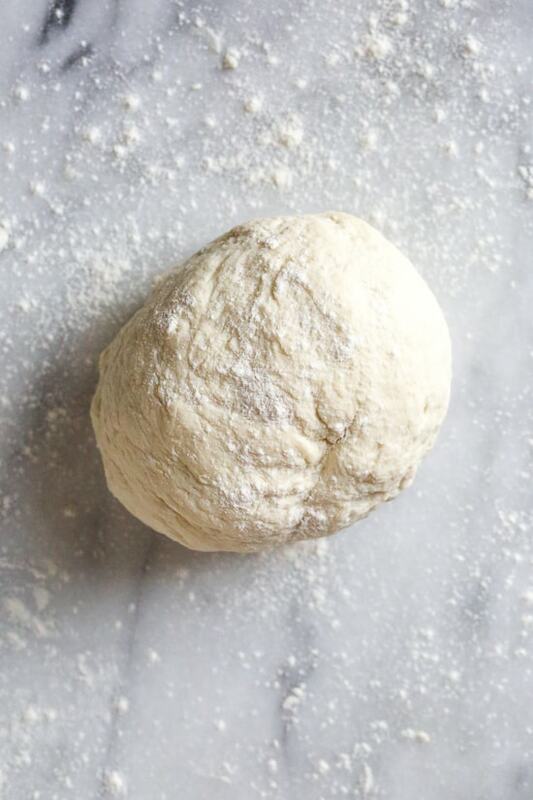 Start with pizza dough, or my homemade pizza dough recipe below and roll out out thin over a floured surface. Heat the grill and oil the grates. Cook the dough directly over the grates covered on both sides until grill marks appear, then remove and add your sauce, cheese and toppings. Return the crust to the grill until everything is hot and melted. 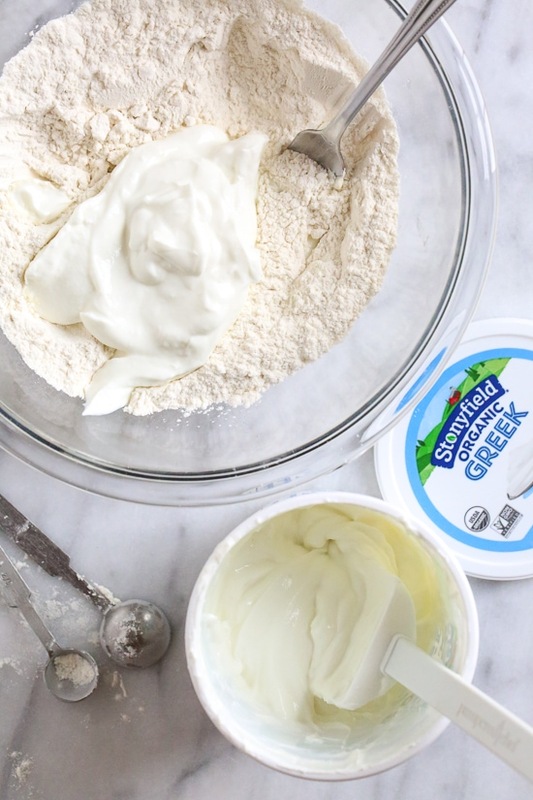 Greek yogurt instead of plain is a must, if there’s any liquid in the yogurt be sure to drain it. 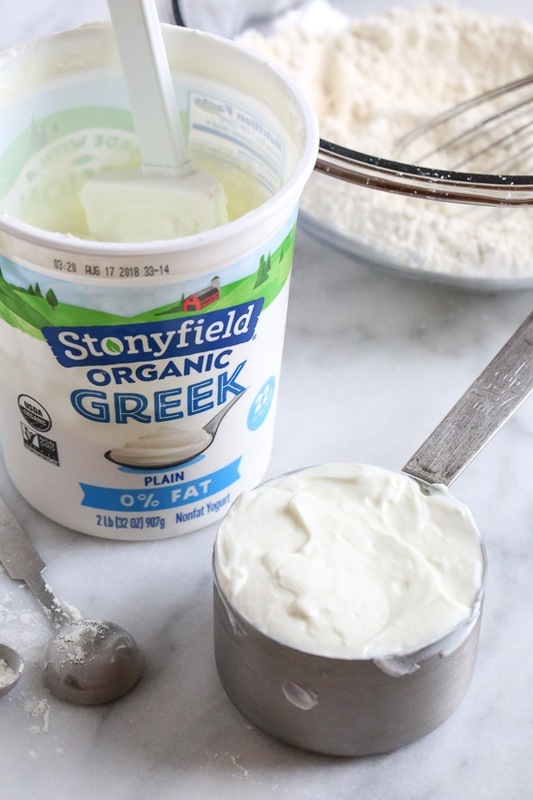 I highly recommend using Stonyfield Greek Yogurt because it’s thicker than other brands. If you use another brand it may result in stickier dough which would be hard to work with. I’ve tested this with white and whole wheat flour. Both work, but the white is lighter and airier. To prevent the dough from blowing up when it cooks, use a fork to pierce the dough all over before cooking. *For gluten free I suggest Cup 4 Cup flour. Clean and preheat the grill on high heat, covered. Working one at a time, divide into 4 equal balls about 3-3/8 oz each. Sprinkle a work surface and rolling pin with a little flour roll the dough out into thin ovals. 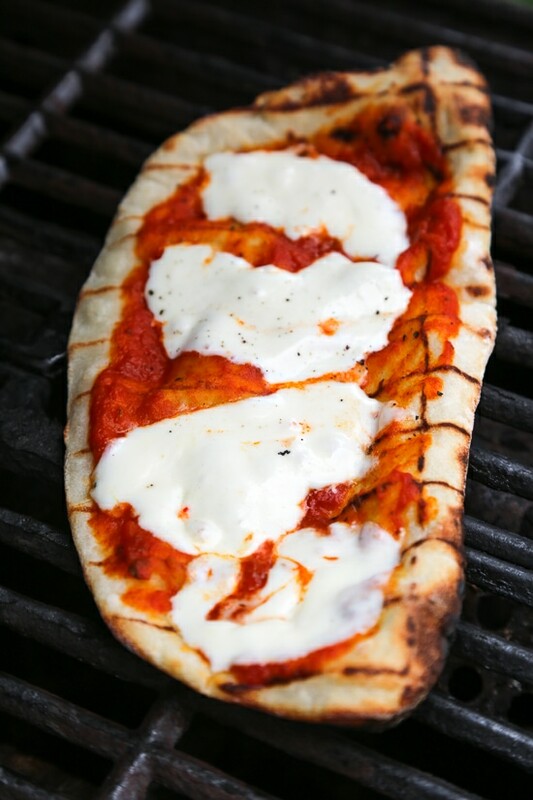 Oil the grates of the grill then add the pizza dough directly to the grill. Cook, covered 1 to 1 1/2 minutes on each side until grill marks appear on both sides. Spread 1 tablespoon pizza sauce over each crust. Top each with 1 ounce of cheese. Put it back on the grill covered until the cheese is melted and bubbling, about 1 minute. Top with fresh arugula, salt and pepper and eat right away. 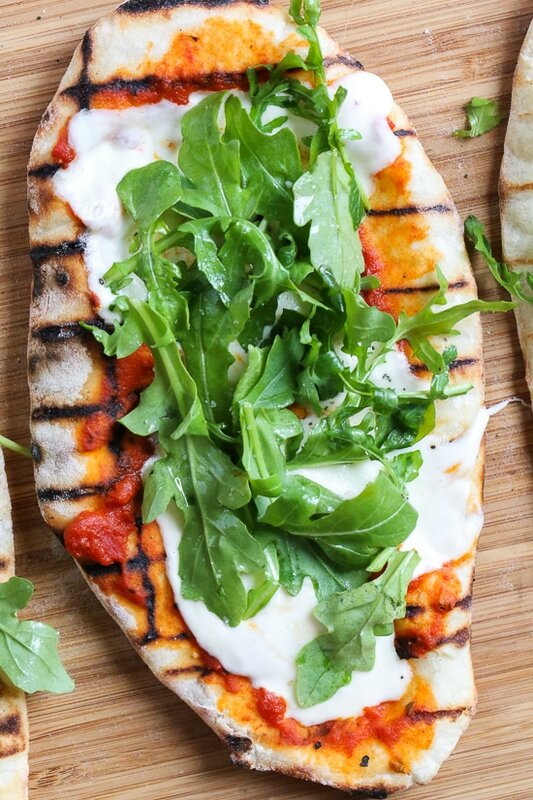 To make this in the oven, bake the dough 450F 10 to 12 minutes turning halfway before adding the sauce and cheese. This was really tasty. And I strongly dislike the smell and taste of greek yogurt, but the dough didn’t have that tangy flavor to it at all. I used basil instead of arugula, but I could see making all sorts of variations on this. Thanks! Made this tonight for dinner. My husband and I LOVED it. That crust is awesome. Is the dough freezable? Would love to be able to make up a few batches and freeze for later. Thanks so much! This was excellent! I used baking steel to cook these up. So easy my husband (who never cooks) made the dough and couldn’t believe how tasty it was! Does the 1 cup yogurt mean just that? I cup fillled or just one cup from the store. Would this work with regular yogurt or does it have to be Greek? BTW I love it but I cook it 8 minutes in the oven, flip, then add the toppings and cook another 8 and it comes out perfect. Hi Gina. We made these last night and topped them with leftover Chicken Marsala Meatballs that I sliced thinly and the mushrooms from the sauce as well. We also used pizza sauce and the fresh mozzarella. They were so good! So delicious! We also added leftover soy marinated flank steak and it was even better! Such a good recipe! I liked it so much that I ended up making a second batch of dough and grilled them plain. 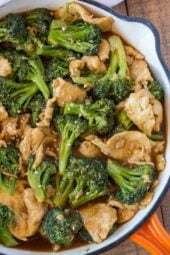 We ate them reheated throughout the week with hummus or with a salad to round out the meal! We really liked it, however, when rolling out it stuck to my silicone rolling sheet. I’d added flour to the sheet. Have others had the same problem? Delicious! Thanks GIna! Will definitely add fresh basil and additional veggies next time, but it was great just as the recipe laid it out. 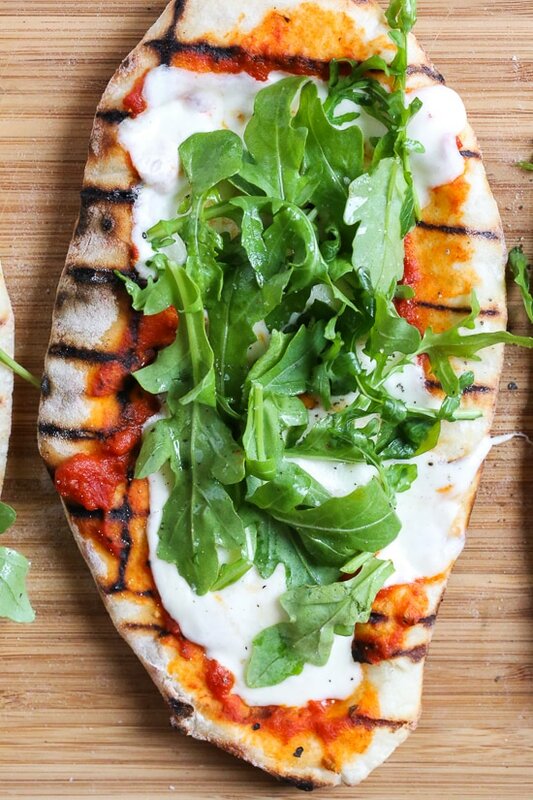 I loved the taste of the grilled dough. 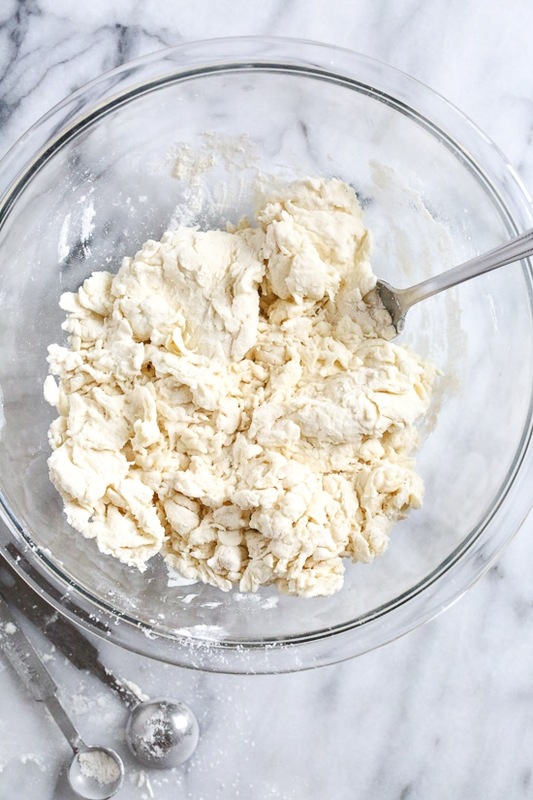 To those having trouble with their dough being too moist; my Italian grandmother always said not to make dough on a day that was humid because the dough would be too moist. Maybe you made them on. rainy, damp, or plain old humid day? if so, you will ned to keep adding flour until it’s just right! That will add points, I assume! I make pizza all the time with this dough, we love it at our house for a personal size pizza. I usually cook it in my air fryer…works like a champ and I don’t heat up the house with the oven! I made this tonight and it was amazing. I baked in the oven on my pizza stone. This will definitely be my new Friday night dinner. Tried this recipe with white whole wheat flour tonight and really wished I would have used regular all purpose. I had high hopes based on the photos and comments, but the whole wheat crust wasn’t the best. Turned out pretty flat. FYI for anyone thinking of trying it. Looking forward to trying it again with regular flour. Thanks for all of the fantastic recipes! Has anyone tried this on a pizza stone in the oven? Can you use a different type of flour such as oat or almond flour? No that won’t work the same unfortunately. I made this tonight and my fussy husband who usually leaves trails of crust edges ate every bite. He loved the chew of the crust. I love pizza and was super impressed by how these turned out!! I used Bob’s spelt flour. Thanks for the recipe! Total game changer! This was very fast and easy! Note: If you are baking on a baking sheet, make sure to oil the pan or it will stick! I don’t recommend trying it with fresh tomatoes rather than sauce, because it made it a bit soggy. Oh my god! Made them again tonight and they are SO good, and so easy quick to throw together!! Thank you, Gina- your recipes make losing weight way more fun and delicious. You are a Gin-ius! 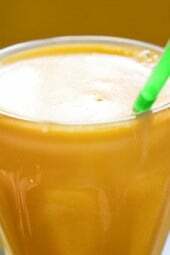 have you ever done this recipe with higher fat yogurt? Its all I have right now and I’d love to try it out. I have whole fat (I know 🙁 ) – it was a substituted for our grocery pickup! P.S. fat is ok, it’s good for you! I altered the toppings a bit and let everyone build their own. They were SO GOOD! Thanks for the recipe! I just made the oven-baked version of this tonight (with Fage greek yogurt) and it was SUPERB. I actually made one big pizza out of the dough and it still baked up great. Cooking it for 10 minutes before adding the toppings was perfect. Gina, you’re a genius! With pizza this quick, easy and low calorie, pizza is back on the menu! This is the first recipe of yours I really struggled with! It came out okay in the end, but my dough was so sticky that I had to add a LOT of flour to be able to roll it out. I almost threw it all away. So I don’t even know how much more flour I used to get the dough to where it was supposed to be, but it was definitely enough that I would have to recalculate the whole nutritional facts. Any ideas why this might be the case? I used the Stonyfield 0% greek yogurt that you had listed. Even though I almost cried while making it, it came out delicious, LOL! Not sure why? You have to always flour your work surface and rolling pin. Perhaps use slightly less yogurt next time. I had the same problem the first batch I made. The second batch, I actually drained the yogurt before adding and that seemed to be the key. I used Stonyfield too but the draining seemed key. I’m making myself a note for next time..it’s mentioned but not emphasized enough for me! I’m not sure what I’m doing wrong but every time I make the dough, its too sticky! Any suggestions on how I can work with the dough? I am using the exact ingredients you say to use! Made this today and it was incredible! My boyfriend who is Italian and a true pizza connoisseur, took one bite and immediately said this the best homemade pizza he’s ever had – and so easy to make – making again and again, thanks Gina!!!!! This was truly restaurant-grade thin crust pizza. I can’t imagine ever buying anything frozen again, and might even go as far as never ordering pizza again. We rolled ours out super thin and cooked 1 min each side before adding the toppings. We used Gina’s quick marinara as pizza sauce and topped it with grated mozzarella, red onions, tomatoes and turkey pepperoni. Then cooked with indirect heat for 5 mins to allow the ingredients to warm up. Topped it off with fresh basil afterwards. Sooooooo delicious and versatile. We already have plans for our next pizzas! Thanks Gina for this truly fabulous recipe that feels like a cheat for only 6 points! Outstanding! 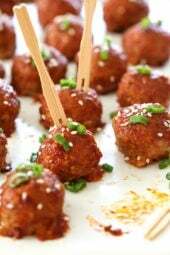 Made these tonight- easy and delicious! I would have these over take out pizza any day! So delicious. Best pizza I have ever made. I am loving using this meal plan this week. Gina, I made this recipe on Saturday, using our gas grill. My husband was skeptical about the grilling of it, and later told me it was the best pizza he’s had in years! We skipped the arugala, added ground hot Italian sausage browned, sliced roasted red peppers, fresh basil, sautéed mushrooms & a tiny bit of Parmesan. Loved it! We are going to be doing this again & it would be fun for a small group! Thank you!! Made a variation of this tonight and it worked great, everyone loved it. I tripled the recipe and made 6 pizzas. I used the Fage strained fat free yogurt and the dough was not too sticky at all. Everyone said if I didnt say it was a skinny dough they never would have known. So good! I was a bit lazy and instead of firing up the grill, I used my grill pan. No oven use at all and it turned out pretty well. 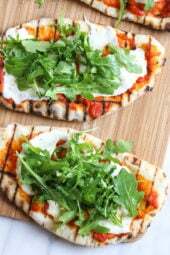 I also forgot to pick up fresh mozzarella, so I used part-skim mozzarella shreds, store-bought sugar free pizza sauce and baby arugula. My husband, who enjoys his frozen pizza, really liked this as did I! I loved the bagels and glad to use this dough again…thanks Gina! Great quick recipe! Excellent tasting pizza. So simple and tasty.I used Trader Joe ‘s brand Greek Yogurt fat free , their low fat mozzarella , their shaved cheese and their canned artichoke hearts. I also topped with fresh basil and tomatoes. I added more flour along the way when the dough was too sticky. I doubled the recipe so I can freeze the precooked pizza and take it for lunch .Don’t be afraid to explore and be creative with recipes. Made this in my oven last night, and it was delicious! I used my pizza stone, and just preheated the oven (with the stone in it) to 450, put the rolled out ovals on a piece of parchment paper, put the parchment paper on a flat cookie sheet, and slid the parchment paper from the cookie sheet onto the hot stone in the oven. No need to move/touch the hot stone in the oven using that technique, which I really like (plus no clean-up needed when you’re done!). Baked for 5 minutes on each side, and the crusts were perfect. For toppings, I used fat free mozzarella to cut down on points/calories a bit, homemade marinara sauce, mushrooms, green peppers, and fresh basil. Slid the ovals with toppings back onto the stone and baked another 5 minutes. SOOO good! Thanks for the recipe/inspiration, Gina! Hi, I understand the promotion, but, we make these on week nights, and for kids parties. I have a hard time rolling dough, I just throw my hands up! But, I discovered an alternative that is fast. Naan Bread. They even have garlic flavored crust, and pizza crust. It’s fast, and the kids have fun setting up their own pizzas. I agree it would be easier to buy naan bread, but the point of this website is to eat healthier. Did you know one piece of naan bread is 12 points? Gina’s recipe that is posted here for the whole pizza, cheese and everything is 6 points. If you’re not following a diet then go ahead and eat the naan bread, but for those of us that choose to eat healthier we will follow this dough recipe. Gina, thank you so much for your time and effort. I so appreciate it. I make my meal plans every week from your website and I never get bored. It is always very interesting reading reviews and I could not let this one go without leaving a comment. Since gluten-free crust is more paste like it will not grill easily. If you do not pre-bake your crust it will fall through the grates like sand. I love this recipe for GF pizza crust and make it all the time but you must prebake it long enough to become one piece. It also takes special care in rolling out, I prefer to roll mine out between plastic wrap sprayed with nonstick spray, flip on to your parchment lined sheet pan and prebake. Then you can remove it and top like a wheat crust to bake or grill on low on one side, flip and move off the heat while you load up with your toppings. Move it back to heat until desired doneness is achieved. Depending on how thin of a crust you begin with, watch it closely. 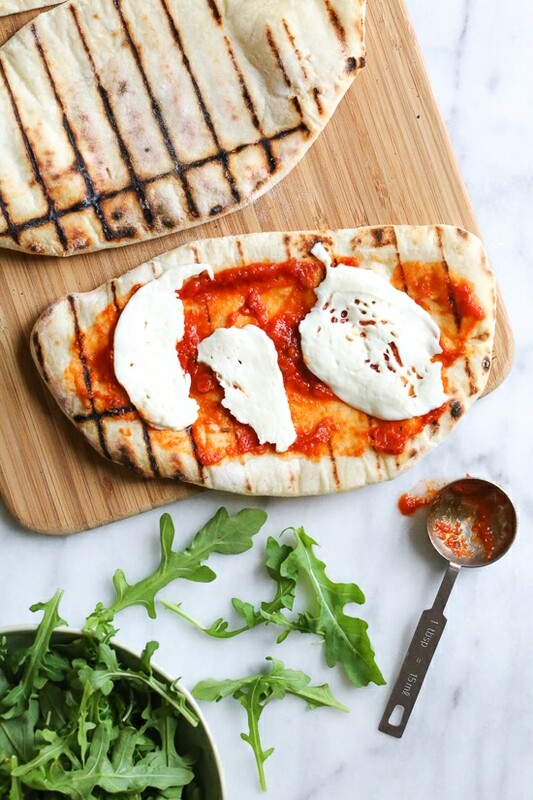 When I first learned to grill pizza, we rolled the dough on parchment paper and placed the dough parchment side up. On the grill. We grilled one side, removed parchment and then flipped. I think the parchment paper kept it Fromm slipping through grates. Might want to try. Will this work with a gluten free alternative? I make the bagels all the time they are great, but my dough is very sticky. I would love to make pizza and other things you do but I can not roll it out. How do you do it? WHat brand of yogurt are you using? Many brands are too watery. My dough was a little sticky as well. I laid the dough between two sheets of parchment paper and rolled it out with great success. Which cup 4 cup, they have a few different varieties. This looks amazing, I cannot wait to make! Instead of grilling, could you use the oven for this recipe? It doesn’t rise as much, that is correct.